Every month of March the town of T'boli in South Cotabato celebrates its colorful fiesta - Seslong Festival, which is also in lined with their foundation anniversary celebration. Various activities are lined up this year for the Seslong Festival 2013 celebration which is already on its 15th edition. Activities includes a fun run, sports activities, the search for Mutya ng T'boli pageant, invitational climb to Lake Holon, medical mission, the much-anticipated colorful Seslong Festival Street dancing competition, and the event everyone is eagerly awaiting - Seket Kuda or horse fight! Below is the Seslong Festival 2013 Schedule of Events. Seslong Festival got its name from a T'boli word which means gather together in a certain place for various socio-cultural activities such as exchange of goods, merry-making and many others. 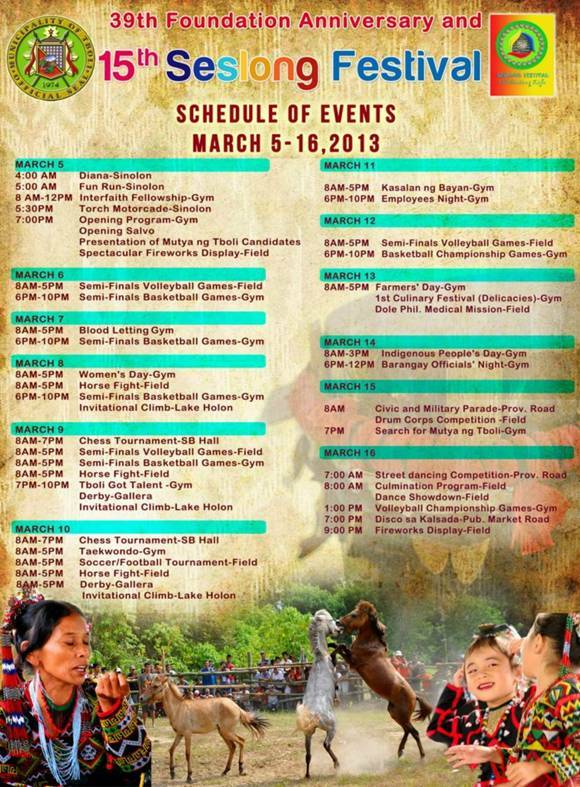 Visit the Municipality of T'boli this March 5-16 for their 15th Seslong Festival and 39th Foundation Anniversary. See you all!